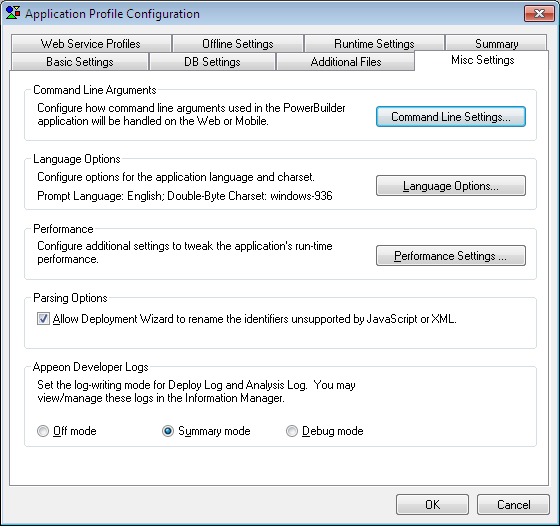 When you click the Configure button ( ) on the Appeon Developer toolbar, the Appeon Developer Configuration window appears with the Application Profiles tab selected by default, as shown in the following figure. 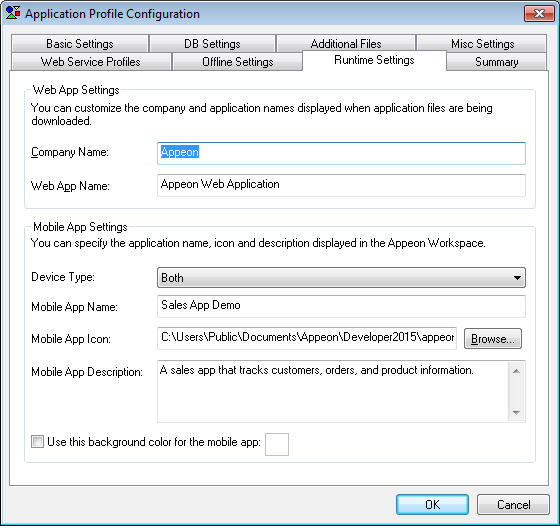 To specify which application profile will be used as the default application profile, select the Default radio button. 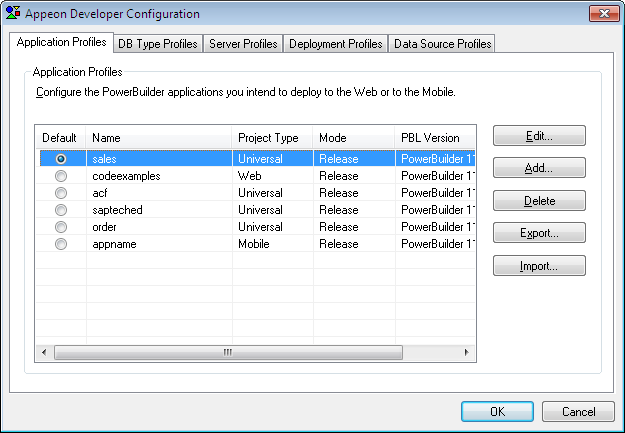 The PowerBuilder application defined in the default application profile is selected for unsupported features analysis, PowerBuilder-to-Web or PowerBuilder-to-mobile conversion, application packaging, and application undeployment. To specify a mode for Web or mobile file generation, click the Mode list box. If you change the mode, you must perform a full deployment to make the new mode effective. Web or mobile application debugging and tuning stage. Click the Delete button to delete a selected application profile. Note: You cannot delete the default application profile. Deleting the application profile will automatically delete the temporary fold for the application profile on the Developer machine. The folder has the same name as the application profile and is created in the \Project folder under the root directory where Appeon Developer is installed (e.g. C:\Program Files\Appeon\Developer2015\). The Export and Import buttons are mainly to back up and restore the configuration of application profile(s), for instance, if you want to transfer the configuration of application profile(s) to another Appeon Developer. Click the Export button to export the selected application profile(s). In the pop-up dialog box, type a file name, then the selected application profile(s) will be saved into the file as XML file format. To select multiple application profiles, you can use Shift+click or Ctrl+click, or drag the mouse pointer to create a selection. Click the Import button to import application profile(s) from the XML file which is generated by using the Export button. If the application profile being imported has the same name as an existing application profile, you will be asked to overwrite or ignore the existing application profile. The application profile name, project type, application URL, PBL version and PBL location of an application. See the section called “Basic Settings”. Perform a full or incremental deployment on the application. The database types, transaction objects and the corresponding data sources. See the section called “DB Settings”. INI files, .NET/COM components, image files and External files. See the section called “Additional Files”. Command line arguments, application language, runtime performance, parsing option, and log-writing mode. See the section called “Misc Settings”. Perform a full deployment on the application. The WSDL file, service name and port for the Web service(s). See the section called “Web Service Profiles”. The offline capacity, start mode, and the local database files. See the section called “Offline Settings”. Company name and application name displayed on the Web application downloading page, and mobile application name, icon, and description displayed in the Appeon Workspace and the target mobile device the application apply for. See the section called “Runtime Settings”. A summary view of the settings. See the the section called “Summary” section for more details. 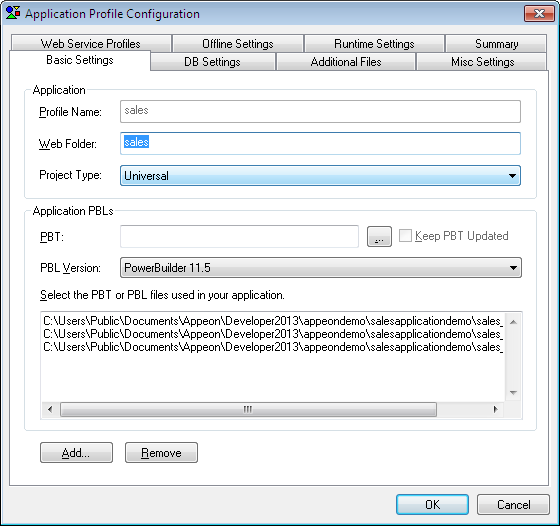 After you click Add or Edit on the Application Profiles tab, the Application Profile Configuration window is displayed with the Basic Settings tab selected by default, as shown in the following figure. The Basic Settings tab allows you to modify the web folder, project type, PBT, PBL version, and PBL location. Profile Name - The application profile name is used to identify the PowerBuilder application during the entire PowerBuilder-to-Web or PowerBuilder-to-mobile process. It is also used in the appeondb database on Appeon Server to identify the DataWindow syntax, profile, and registry information for an Appeon application. The Profile Name cannot contain double-byte characters (such as Chinese, Korean, or Japanese characters) or special characters (such as, \, /, :, *, ?, ", <, >, or |). Web Folder - The specified text is used as the name of the folder created under the Web root (or document root) of the Web server for storing the Web or mobile application files when the application is deployed, therefore, the URL for accessing the deployed application will be in this format: http://web_server:port/web_folder/. The Web Folder can contain a combination of letters, underscores ("_"), and numbers. Avoid setting Web Folder as existing folder names in the Web server Web root (or document root), because: (1) If a Web or mobile application uses an existing folder under the Web root as the Web Folder, a large number of Web or mobile files belonging to the application will be deployed to that folder, making it difficult to use the folder for its original purpose. (2) If a Web or mobile application uses a folder that is reserved for the Web server or Appeon Server, some important files belonging to the Web server or Appeon Server may be replaced or even removed when the application is undeployed. The following are folder names reserved for the Web server or Appeon Server that should not be used as Web Folders: appeon, classes, docs, images, ir, wst, and WEB-INF. The Web Folder for an application profile can be changed, and the Web or mobile files stored at the Web server can have different versions for the client to access, but Appeon only remembers the Web Folder in the last deployment, and performs the application packaging and application undeployment based on the Web or mobile files generated in the corresponding folder. Project Type - The Project Type determines whether your PowerBuilder application will be configured for the Web migration process, or the mobile migration process, or both. Web -- Deploys a Web app only. The Web target supports the most PB features including Windows PC technologies, such as DLLs/OCXs. Mobile -- Deploys a native Mobile app only. The Mobile target supports mobile-specific functionalities instead of Windows PC technologies. Universal -- Deploys both a native Mobile app and a Web app. The Universal target supports the same features as the Mobile target. If your app uses Windows PC technologies, such as DLLs/OCXs, you cannot use the Universal target. Click the browse ... button and choose to add an application Target file (*.pbt). By adding PBLs using an application Target, all PBLs in the Target are automatically added to the application PBLs list. This is the recommended way to add PBLs, as it reduces the likelihood of forgetting to add a required PBL. Click the Add button and add PBL files without using an application Target. You can add one or multiple PBL files at the same time. To select multiple files, hold down the Ctrl key and choose which files to add. Copy and paste (Ctrl+C and Ctrl+V) the path list of PBLs into the Application PBLs field. Note: Keep the Keep PBT Updated checkbox checked if you want Appeon to automatically update the PBLs every time you deploy an application. This ensures that any newly added PBLs will be deployed and so avoids missing PBLs after deployment. 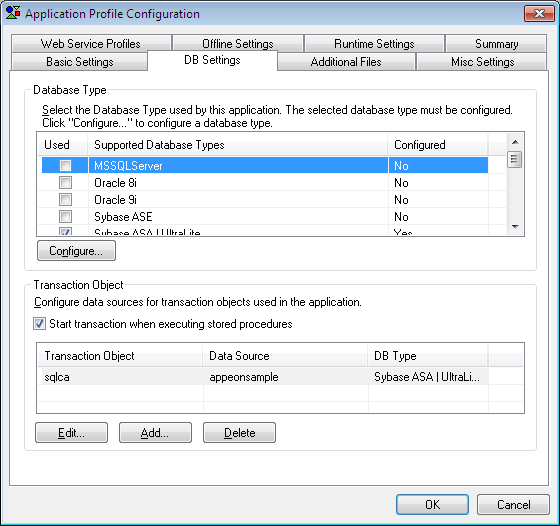 The DB Settings tab allows you to specify the database types and the transaction objects that the application uses, as shown in the following figure. When configuring the database types, it is not necessary to specify the actual databases that the application uses, it can be any database of the same type. However, when specifying the transaction objects, you must specify the actual transaction objects that the application uses. PowerBuilder SQL statements must be converted into the correct database syntax before they can be used to retrieve data from the database that the Web or mobile application connects to. The DB Type settings enable Appeon Developer to apply the correct database driver type for generating correct database syntax for PowerBuilder SQL statements. Select the database type(s) used by the application, as shown in the following figure. The following table describes each element on the DB Type tab. You can click the check boxes to select the database types used by the application. More than one database type can be selected, but only the configured database types are selectable. This column lists all the database types that are supported by Appeon. This column is identical to the Configured column in the section called “Managing database type profiles”. It indicates whether a profile has been configured for the database type. If this column of the desired database type is "No", you must click the Configure button to configure a profile for it before you can use it. Configuring a database type profile in this tab is the same as configuring it in the DB Type Profiles tab. Once a database type profile is configured successfully, the Configured column in both this tab and the DB Type Profiles tab changes from "No" to "Yes". Click Add or Edit to configure a transaction object and specify the corresponding data source. Refer to the section called “Declaring transaction object(s)” for detailed description. It is strongly recommended that you keep this option enabled. The only circumstance you may consider disabling it is when there is commit statement executed inside a stored procedure (SP) and there is no need to commit in the PB code; the reason is that by default Appeon Server will start a transaction once an SP is executed, and the user will be able to see details of this transaction in the Active Transactions tab in AEM; when commit is executed inside the SP, the transaction will end and disappear from the database end, but as there is no commit in the PB code, this transaction will still appear as an active transaction in AEM, which will mislead users to think this is an uncommitted transaction. To avoid this misunderstanding, you can disable this option, so Appeon Server will not start a transaction when an SP is executed. 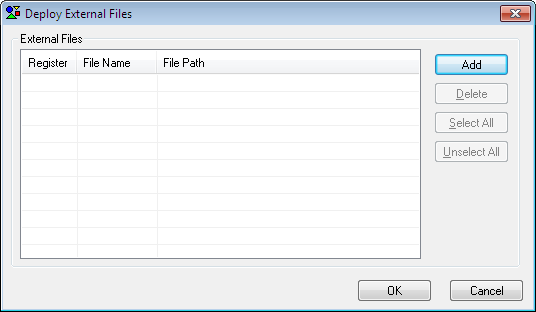 "Additional files" refer to the files that are outside the application source code, but are necessary for running the PowerBuilder application, including INI files, .NET/COM components, image files, and external files, such as DLL/OCX files, text files, etc. If a PowerBuilder application uses an initialization (INI) file which contains user preferences, specify the INI file in this tab so that Appeon can deploy the file for the application. Click Add to add the INI file(s) into the Deploy INI Files list box. During deployment, the specified INI file(s) are converted to XML file(s) and deployed to Appeon Server. The XML file(s) act as mock INI file(s). When a Client runs the deployed application for the first time, a copy of the XML file is created in Appeon Server and keeps the Client's profile information. For a Client to use the correct profile information in its subsequent visits to the application, the Client browser must be cookie-enabled. Otherwise, each time the Client visits the application, a new copy of the XML file is created in Appeon Server, and the new copy only contains the information of the original INI file. You can delete the XML files that are unused for a period using Appeon Enterprise Manager (AEM). For more information on how to maintain XML files in Appeon Server, refer to the section called “Auto cleanup” in Appeon Server Configuration Guide for .NET or in Appeon Server Configuration Guide for J2EE. If a PowerBuilder application uses .NET/COM components which contains executable files (.exe), and COM/COM+ components, specify the .NET/COM components file in this tab so that Appeon can deploy the file for the application. Click Add to add the .NET/COM components file(s) into the Deploy .NET/COM components list box. Click Browse to specify which folder contains the image files that will be used in the Web or mobile application. If you do not specify the path of the image files, the path to the application PBL files will be displayed as the default path of the image files. All the image files in the specified folder will be deployed to the %Web Folder%/images folder in the Web Server. %Web Folder% stands for the folder storing the Web application files or the mobile application files. The image files may fail to be displayed on the Web or in Appeon Workspace, or on mobile devices if the file names are stored in the database or dynamically generated. To resolve this, you can copy the image files directly to the %Web Folder%/images folder, but make sure that the file names are all lowercase; otherwise, the Web or mobile application may fail to load them. If your application calls any custom user DLL/OCX files (for Web applications only), which are also called external non-system DLL/OCX files in this tab; or if your application calls any other external files, such as text files, PDF files, image files etc., you can specify them here and deploy them to the Web server. Deploying DLL/OCX files is used as an example in this guide. 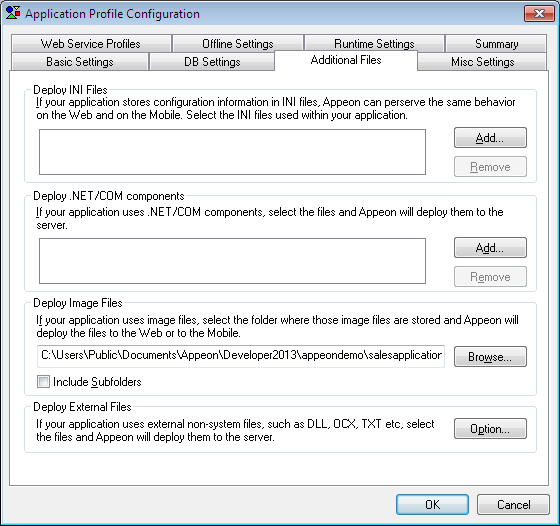 If there are many large-size DLL/OCX files in your application and they could be slow to download from the Web server at runtime, you may prefer to use the DLL/OCX File Packaging tool provided by Appeon to package the files into one setup program (see Extended Toolkit for detailed instructions), then distribute the setup program to the users, and have the users install the files to each Client. Click Option... in the Deploy External Files group box to open the Deploy External Files dialog box (as shown in the following figure) and select the required external files to be deployed. The following table introduces the elements in the Deploy External Files dialog box. Allows you to select whether the file will be automatically registered after it is downloaded to the Client at runtime. Click Select All to select all files and Unselect All to de-select all of them. If you choose not to automatically register a file, you can register it manually after it is downloaded. Lists the added files. Click the header of this column to display the files in alphabetical order. You can add any file of any type. The following table describes how to add and remove files in the Deploy External Files dialog box. Click the Add button. A standard File Selection dialog box is displayed. And then select the files from your local machine. The files can be stored in any location. Select a file or multiple files using Ctrl or Shift keys, and click the Delete button to remove the selected files from the list. Appeon will copy the files to a temporary folder and then deploy them to the Web Server during deployment. To successfully call the deployed DLL/OCX files in the Web application, you need to make sure that the DLL/OCX files are successfully downloaded and installed to the Client during the initial run of the deployed Web application. Appeon Enterprise Manager (AEM) provides options for manually or automatically downloading and installing the DLL/OCX files, and for specifying the installation location (by default the files are saved to the "plugin" folder under the application directory on the client machine). For detailed instructions, refer to the section called “DLL/OCX Files” in Appeon Server Configuration Guide for .NET or in Appeon Server Configuration Guide for J2EE. The external file will be automatically downloaded and saved to the client when the deployed application is run for the first time. The default location is the "plugin" folder for each application. For more details, refer to the section called “What files will go to the plugin folder and how to access them” in Workarounds & APIs Guide. The Misc Settings tab page enables you to modify settings for command line arguments, application languages, double-byte charset, and log-writing modes, and allows you to configure the runtime performance and parsing options. If an application needs to use command line arguments, enable the command line argument option, as shown in the following figure. Click Command Line Settings on the Misc Settings tab. The Command Line Settings dialog box is displayed, as shown in the following figure. Require a command line argument for the application option: Enables the command line argument option. With this check box selected, the following two options will be enabled. Note that they are effective only if you run the application from the Appeon Developer toolbar. Show argument input/confirmation dialog option: A dialog box is displayed after you launch an application from the Appeon Developer toolbar but before the application starts. This dialog box enables you to specify the arguments for the application. Specify the default command arguments field: The specified default arguments are directly attached to the application URL when the application is run from the Appeon Developer toolbar. If both options are selected: A dialog box pops up with the default arguments filled in, as shown in the following figure. You can either change the default arguments or leave them alone. To run an application with arguments from Clients, type the application URL with the arguments. The format of an application URL with arguments is: http://AppURL/index.htm?ArgValue. ArgValue indicates the arguments that will be passed to the application. The arguments must be separated by commas if there are more than one argument. Step 1: Click Language Options on the Misc Settings tab. 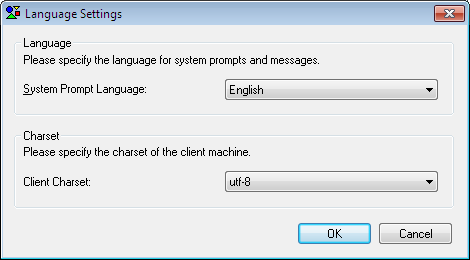 The Language Settings dialog box is displayed, as shown in the following figure. System Prompt Language: Select a language from the System Prompt Language dropdown list box (Only English available when you are using an English version of Appeon for PowerBuilder). System prompts are error messages, informational messages, warnings, notices, and prompts that are displayed when you run Appeon applications. Client Charset: Skip this if your application is a Web application or if your mobile application does not use any string function that ends with "A", otherwise, select a charset the same as that of your PowerBuilder development environment for the mobile client. If your application uses string functions that end with "A" (e.g. FillA, LeftA, LenA, MidA, PosA, ReplaceA, and RightA) to process the double-byte character, these functions may return different values on iOS and Windows, because iOS system uses UTF-8 encoding while the Windows system uses UTF16 encoding. Due to this difference, in order for these functions to return the same values on iOS and Windows, you need to specify the charset here the same as the charset of your PowerBuilder development environment. And make sure the mobile client supports the specified charset, otherwise, these functions could not return the correct values or may even cause the application to crash. For the sake of safety, we suggest you not use string functions that end with "A" (e.g. FillA, LeftA, LenA, MidA, PosA, ReplaceA, and RightA) to process the double-byte character, use the functions without “A” instead (e.g. Fill, Left, Len, Mid, Pos, Replace, and Right), so as to avoid any potential issue that could be caused by specifying an improper charset or the mobile client not supporting the specified charset. Step 2: Click OK to save the settings. Step 1: Click the Performance Settings on the Misc Settings tab. The Performance Settings dialog box is displayed, as shown in the following figure. Step 2: Select the performance features based on your needs. The following table describes how to use the performance features. Compresses files when they are transferred over the network. Merges the small files during the application deployment. The small files will be downloaded to the client in one file package at one call, instead of being downloaded one by one at separate calls. Enables the application to be deployed in a method compliant with the Performance Analyzer tool. The application deployed with this option can run with the Performance Analyzer tool at runtime to diagnose the performance issues. For more about the Performance Analyzer tool, see the section called “Appeon Performance Analyzer” in Appeon Performance Tuning Guide. Note: as the data is not encrypted during transmission at runtime, therefore, this option is recommended to use only at the test or development stage. Downloads the two ActiveX files in the same thread at runtime. Using the same thread to download the two ActiveX files can speed up the download under particular network conditions. For more information about the Appeon ActiveX file, refer to the section called “Installing Appeon ActiveX control” in Supported PB Features for Appeon Web (Web only). With this automatic-renaming option enabled, when the Appeon Deployment Wizard deploys an application, it automatically detects unsupported identifiers in the application and renames these identifiers to supported ones in the files it generates for the application, while keeping the application source code unchanged. After the deployment, you can get the list of all the identifiers that are renamed in the deployment log in Using Information Manager. The automatic-renaming feature will not work if the option is disabled. In this case, you must rename the unsupported identifiers by yourself, following the guidance of the UFA report and the section called “Identifiers” in Supported PB Features for Appeon Mobile (Mobile only) or in Supported PB Features for Appeon Web. The log-writing mode determines the content of the log files generated by Appeon Developer, including the deployment logs and feature analysis logs. Select the desired mode from the Appeon Developer Logs box, as shown in the following figure. This mode offers the fastest performance since nothing is written to a log file. Generates log files with basic execution information. This is useful for tracking errors that have occurred, but inadequate for detailed troubleshooting. Use this mode once the application is stable. Generates log files with detailed execution information for troubleshooting obscure and esoteric issues. This is useful for technical support, but performance speed will slow down when using this mode. You can view or delete these log files. For detailed instructions, refer to Using Information Manager. A Web service profile contains the settings for the Web service(s) to be invoked in the Appeon deployed application, including the WSDL file, service name and port to be used by the Web service. After you specify the PBL files of the application in the Basic Settings tab, the Web service proxy objects, WSDL files, service, and port, which are used in the application, are automatically added to the Web Service Profiles tab, as shown in the following figure. The WSDL file must be a .wsdl or .asmx file. The WSDL file must reside on the local computer. Appeon cannot access the WSDL file in a remote machine. WSDL files used in the same application cannot have the same name, even if they reside in different locations. Choose which proxy object(s) will be invoked in the deployed application by selecting the Used column of the object. Click Select All to select all objects; click Deselect All to deselect all objects; or click Invert Selection to select all objects which were not selected and deselect the previously selected objects. Step 1: Select the proxy object and click Configure. The Configure dialog appears, as shown in the following figure. 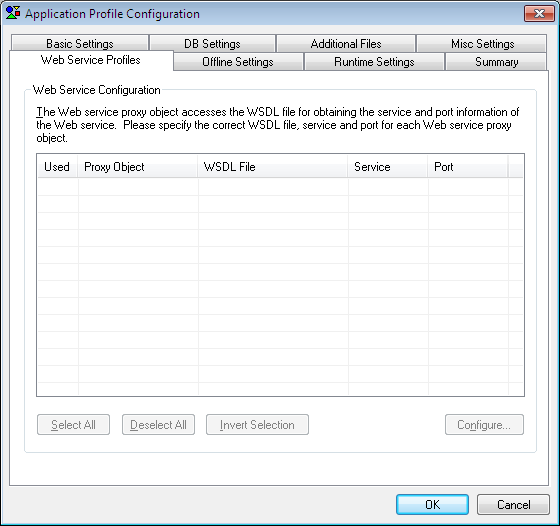 Step 2: Click Browse to select a WSDL file on the local computer, and then select the service and port. A WSDL file may contain multiple services and each service may contain multiple ports. Step 3: Click OK to save the configuration and return to the Web Service Profiles tab. This section is for mobile applications with offline capabilities and users that have purchased the Enterprise edition with offline support. design an application that can read and write data from the local databases (SQLite or UltraLite), and synchronize the local database with the back-end database server. You will need to first use the DBParm properties (see transaction object in Supported PB Features for Appeon Mobile (Mobile only)) and then configure and deploy the database file to the local device through Appeon Developer, so the application can access the local database. For detailed instructions, refer to Appeon Mobile Offline Tutorials (Mobile only). To synchronize the UltraLite local database with the database server, you could take advantage of the PB synchronization object MLSync and the SQL Anywhere synchronization server MobiLink. To synchronize the SQLite local database with the database server, you would need to develop your own synchronization solution, because SQLite cannot work with MobiLink or any other equivalent product or solution. If the application is deployed to start at the offline mode, the app can start without connecting to the Appeon Server except for the first time when it needs to download the configuration information for local use. According to the ASA/SQL Anywhere documentation, the UltraLite database that works on iOS must be at version 12 (Appeon Mobile 2015 only supports UltraLite 12.0.1 and will work on to support the later versions in the future versions), and the corresponding MobiLink server must be at the same version. If they are not at the required versions, upgrade them by following the steps in the SQL Anywhere 12 help: SQL Anywhere 12.0.1 > SQL Anywhere 12 > Changes and Upgrading > Upgrading to SQL Anywhere 12. The SQLite database should be at version 3.x or later. Using ASA/SQL Anywhere for development. When developing the PowerBuilder application, the ASA/SQL Anywhere database should be used rather than the UltraLite database, because there are many issues using UltraLite with PowerBuilder according to our test results. It is recommended that after finishing the PowerBuilder application development, export the table schema and data from the ASA/SQL Anywhere database to the UltraLite database (by using the tool provided by Mobilink), and then use the UltraLite database in the offline application. Creating synchronization scripts for SQLite. Unlike UltraLite which can synchronize data through the MobiLink server, SQLite cannot work with MobiLink servers, or any other synchronization servers similar to MobiLink. Therefore, you would need to develop your own synchronization scripts if synchronizing the SQLite local database with the database server. The Offline Settings tab allows you to configure the offline capacity, the start mode, and the local DB settings for the mobile applications. These configurations and configured files will be deployed to the Appeon Server along with the application. Offline Capacity: Check the Support Offline checkbox if your application needs to enable support for the offline features. If it is not checked, the application works as a standard Appeon Mobile application that always connects to the Appeon Server. Start Mode: Allows you to set whether an application to be launched online or offline. The online mode requires network connections from the mobile device to the Appeon Server, while the offline mode does not. The following table describes the three start modes in details. Network connection from the device to the Appeon Server is needed when the application starts and runs. If the application is set to start online, then it starts and runs the same way as the standard Appeon applications (except that the application can access the local database), which means, it must connect to the Appeon Server for loading the application file, getting updates, managing user sessions, etc. The application starts without connecting with the Appeon Server, except for the first time. For applications that starts offline, the application must connect to the Appeon Server to download the configuration information only for the first time, after that, the application can run locally without needing any network connection. 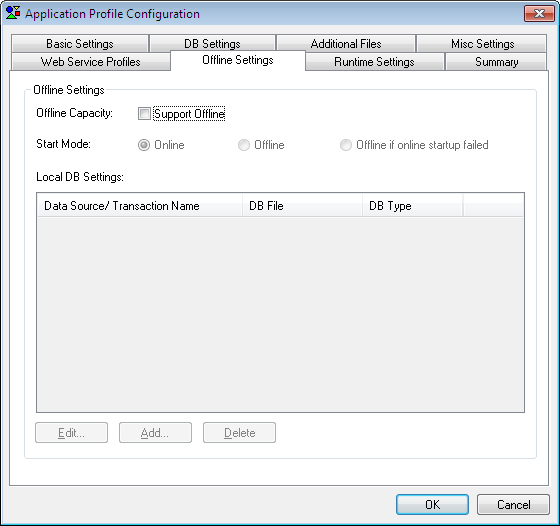 If your application needs to access the database, then you would need to enable the local database accessibility using DBParm of transaction object in Supported PB Features for Appeon Mobile (Mobile only) and configure the database file deployment in the Local DB Settings table below, in order for the database file to be downloaded and accessed on the local device. Unlike the other Appeon applications, the offline application will not be automatically updated, because it runs locally without connecting with the Appeon Server; therefore, you will need to write code in the application to call the APIs to get updates from the Appeon Server. Refer to the section called “of_checkupdate” in Workarounds & APIs Guide and the section called “of_applyupdate” in Workarounds & APIs Guide. The application will first try to start online (in an attempt to connect with the Appeon Server), if the online startup fails (due to the bad network connection, wrong URL, etc. ), then it starts offline. If the application has already run as an offline application and then is re-deployed as an online application, it will need to get updates (the new start mode) from Appeon Server first and then restart, then it will run as an online application. Which means, you will need to write code in the app to call APIs to get updates first, and then the end user will need to quit and run the application again as the application cannot automatically restart. If the application has already run as an online application and then is re-deployed as an offline application, it will need to restart and then it will run as an offline application. Which means, the end user will need to quit and run the application again as the application cannot automatically restart. Local DB Settings: Specify the data source/transaction name and the database file that will be deployed to the Appeon Server, and later downloaded to the mobile device and accessed by the application at runtime. You can specify these items by adding a new local database, editing, or deleting an existing one. To add a new local database, click Add, and the Local Database Configuration window appears. In the Local Database Configuration window, specify the items (according to the following table), click Test to test the connections, and then click OK to save the settings. The following table describes the items in the Local Database Configuration window. Select Data Source or Transaction. To use the transaction object to connect with the local database for the application, select Transaction; to use the CacheName parameter of DBParm in the transaction object to connect with the database, select Data Source. By using the CacheName DBParm, you can conveniently switch database connections in the same transaction object. For more about the preferable scenarios using the PB transaction object or using the CacheName DBParm, refer to the section called “Connect with the local database” in Appeon Mobile Offline Tutorials (Mobile only). For more about the syntax of CacheName DBParm, see the section called “Transaction” in Supported PB Features for Appeon Mobile (Mobile only). Enter a data source or transaction name. If the Type is Data Source, the Name must be the same value of the CacheName DBParm; if the Type is Transaction, the Name must be the exact name of the transaction object in the application source code. 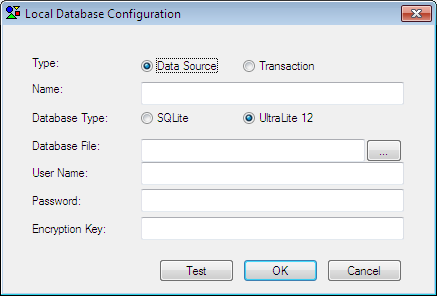 Select SQLite or UltraLite 12. The database file must exist and be valid, and the name cannot be "appeondb.db". The database file will be deployed to Appeon Server when the application is deployed, and will be downloaded to the local device when the application is downloaded for the first time. The database file on the local device will not be updated unless you write code in the application to call of_applydbupdate in Workarounds & APIs Guide to get the latest database file from the Appeon Server. Enter the user name for the database. This field is only required for UltraLite. Enter the password for the database. Enter the encryption key for the database. This field only supports UltraLite. You should input the same encryption key which is specified when creating the UltraLite database in the Create Database Wizard in Sybase Central, so that the Appeon mobile application can read/write the encrypted database. For more about encrypting the UltraLite database in Sybase Central, see the section called “See also: Encrypt UltraLite database” in Appeon Mobile Offline Tutorials (Mobile only). To edit a local database, select the local database in the Local DB Settings group box, and then click Edit. In the Local Database Configuration window that appears, make the changes according to your needs, and then click OK.
To delete a local database, select the local database in the Local DB Settings group box, and then click Delete. Click Yes to confirm the deletion in the popup message box. the company name and the application name that will be displayed on the Appeon Download Center when the Web application starts. the mobile device type (tablet or smartphone) on which the mobile application will run. the mobile application name, icon, and app description that will be displayed in Appeon Workspace. For optimal display quality, we recommend using icons with 86 x 86 pixels for low-resolution screens (such as iPad 2), and 172 x 172 pixels for high-resolution screens (such as iPad 4). But generally you can use icons with any size, because icons smaller than the above recommended size will be automatically stretched to the proper size for the corresponding devices; and icons larger than the above recommended size will be automatically shrunk to the proper size for the corresponding devices. Therefore, for convenience, you can use icons with 172 x 172 pixels or above for all devices. The recommended formats are PNG and JPG. For other supported formats, refer to the section called “Image & Icon” in Mobile UI Design & Development Guide (Mobile only). If you leave the Mobile App Icon field empty, the default icon will be displayed in Appeon Workspace. the background color of the mobile application. If this option is not set, the default image will be used as the background for the mobile application. 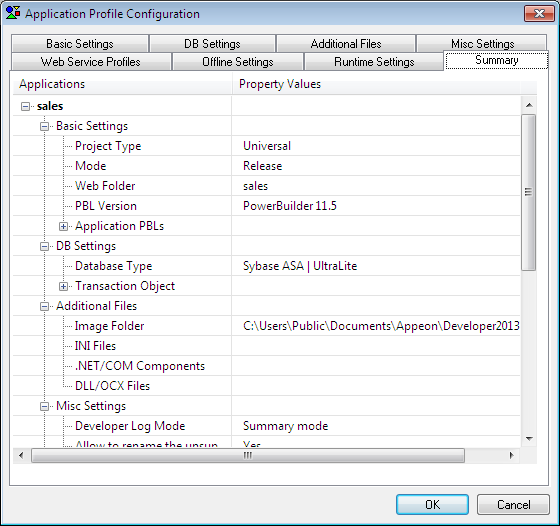 The Summary tab offers a summary view of all configurations of an application profile. It lists the configurations in a treeview structure, and allows you to review and modify their values directly. For properties that you can input or select values by using a text field, radio buttons, or dropdown list, such as Mode, Web Folder, PBL version, etc., you can directly double click their Property Values column and then input, modify or select values. For properties that you can add/delete multiple items by using a dialog box, such as application PBLs, INI files, etc., you can right click the property name in the Application column and then select Add or Delete All from the popup menu. The configuration changes you make in this Summary tab page will be immediately synchronized to the other tab pages, but only after you click the OK button, the changes will be saved.